The Arakawa river stretches up out of Tokyo Bay and into the Saitama mountains, passing straight through the bulk of the city, picking up stray cyclists looking for a place to go as it meanders above and below ground. Some of the cyclists that accrete to its bike-pathed banks come prepped with tents and gear to camp out, BBQ, and generally make merry. This past weekend Jason and I revisited our old Saitama free-camping ground via an 80km ride up the Arakawa river, this time with Can. Mike in tow on his new black Trek, as well as assorted women who took the train and buses to meet us there for a BBQ and the Cotton Cafe. Saturday it was great mild cycling weather, and we stormed North up the cycling track (map below) averaging between 25-35 km/hr. It felt good to be able to race along past all the familiar features: the Helipad, Sakura Park, the abandoned JCB and Motocross track, the peanut bridge, the half-built highway, the big damn, and so on. We still managed to get lost at a wrong turn- taking a diversion through a golf course where old men made large X-es at us with their arms and tried to wave us away. I gave them all a big grin and thumbs up as we rolled off. That’s a shot of me on the left and the Can on the right, grinding it out. At some point we rolled past this fella, who I stopped for a photo-op with. 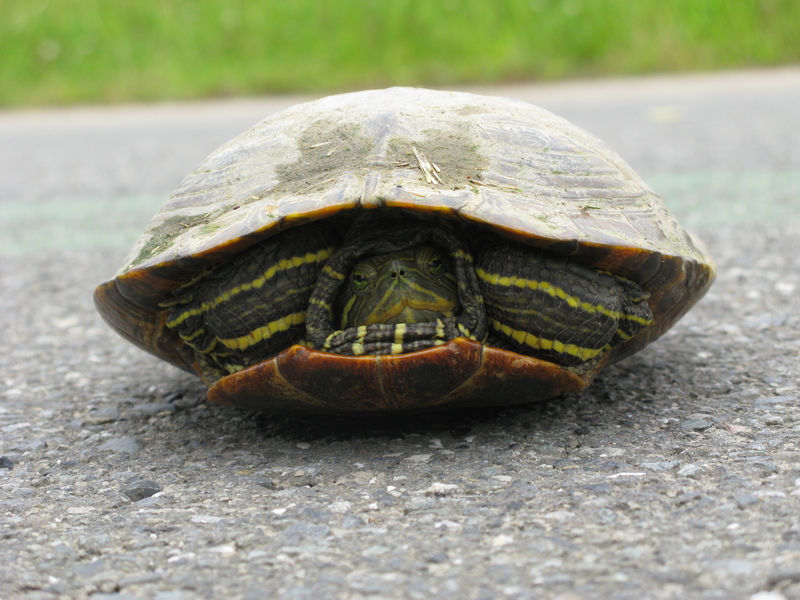 He was just crawling across the cycle-path. We set off around 10:15 from Ikebukuro and made it to the camp-site in Higashi-Matsuyama around 3:30, where Aya and Su-Young were already sat looking bored. 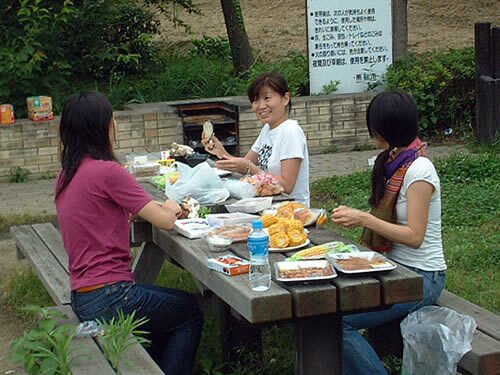 I gave them a frisbee and we set off to pick up Kumi at the Cotton Cafe and get BBQ supplies. At the Cotton Cafe we put Kumi on the back of my bike and set off for food. The conveni had nothing so Jason and I had to race off to BELC supermarket 4km down the road- where I picked up sausages, ground beef, yakiniku (BBQ grill Korean-style) meat, assorted veg, plates, and etc.. I spent quite a while picking stuff out as I didn’t want to not buy enough, or not buy the right stuff. That’s Kumi on the back of my bike. Back at the camp-site I tipped all the stuff on a picnic-table and the girls set to work slicing, chopping, and generally doing prep while the men got on with lighting the charcoal. It took us a while to get it going, involving me burning my fingers a few times trying to pick up cold-looking charcoal that turned out to be very hot. I fared better than the tribe of ants though that must’ve nested alongside the BBQ grill. They came flooding out, carrying their eggs, once the grill started to get hot. The girls in the mean-time had made an excellent spread on the table- the ground beef converted to onion-stuffed hamburgers, huge sausages and corn on the cob chopped to a manageable size, veg sliced and in neat piles, condiments ready. 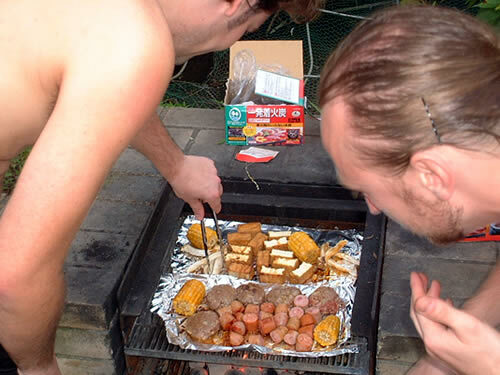 We slapped that stuff straight on the barbie, with a few foil sheets beneath it. This is the girls doing prep. This is Jason (left) and me tending the grill, meat to the fore, veg only at the back. It has to be said, the foil sheets were a great idea. Meat simmered in its own juice, soy sauce bubbled away, the hamburgers held together, and not a thing was lost through the cracks of the grill. It all turned out to be delicious. The hamburgers were a delight, the sausages, the corn, everything. In fact we didn’t even make it to the yakiniku meat as the rest of it was so filling. I was very pleased indeed. After that we sat around and drank a bit, goofed around climbing onto the abstract art concrete blocks in the nearby fields, then eventually headed out for the Cotton Cafe jazz club. They weren’t so pleased to see us there this time- the cover charge was 2,500 yen, they told me they had no beer, and it briefly seemed like we were just going to bail on it completely. Then the girls wangled free entry, beer materialized, and we got to enjoy some very skilled jazz for about 20 minutes. After that we trundled back to the camp-site in a light rain, assembled the tents, and crashed out. The next day was constant heavy rain. We had a light breakfast including Su-Young’s delicious home-baked blueberry muffins in the shelter, then packed up in the rain, then the men headed off on their bikes, and the women headed off to their bus. That’s breakfast mostly finished. I posed with a smile for another photo, but it seems to have been lost. The rain didn’t let up all day. We left around 9am, and didn’t get home til around 2:30pm. We got soaked through despite all wearing rain gear. Stopping to eat in the rain, taking a break in the rain, it all became quite natural. Mike flagged behind some towards the end of the ride, and I felt like flagging too, but for the most part kept up with Jason who was setting a tough pace- especially at the end stretch. On the whole, it was another excellent weekend- though I doubt we’ll go there again. If we do a little research I’m sure we can find a better proper camp-site in a more beautiful setting with more for the girls to do, better groceries access, better overall access, and hot showers! Photo credits have to go to Can Mike, as the only photo I took all weekend was of me and the turtle. The low-res shots are screenshots lifted out of Jason’s fun video of the trip, which you can watch here. Smile :)Â It may never happen. 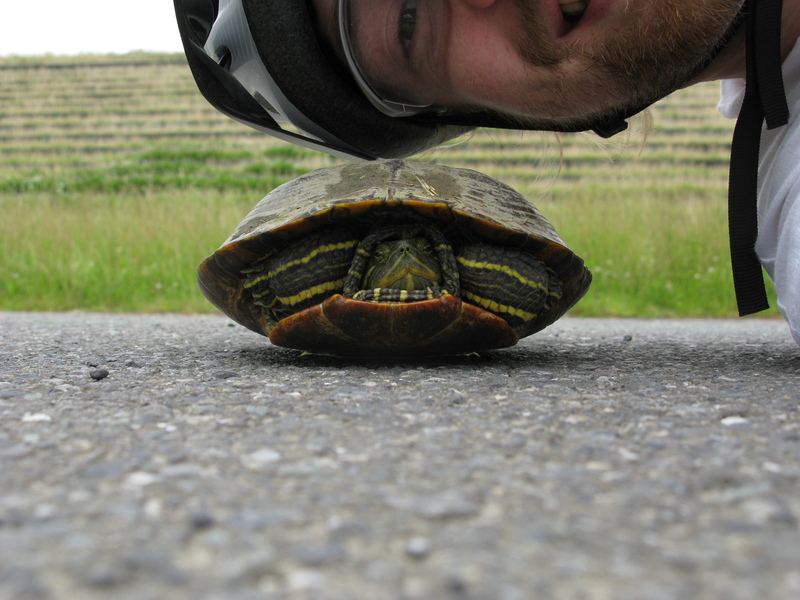 Nice turtle photos…he seems to be nonplussed about getting rescued though! The Can’s Trek is actually black! I remember when he met us I was surprised it was black and not red also. Very unlike you to not take photos and videos! I guess you were concentrating on riding. We were riding along at a pretty good pace. Mostly though I need a front bar-bag to make camera access much easier. No reason for no photos at the BBQ though- I even took my camera out. Just too lazy! What a fun thing to do and the barbecue looked great!! Yes, hot showers….they must have them there…are pretty important. wait… I’m at brady’s place and people wanna know… who is Su-young?